The Korg Kaoss Pad is a multiple effects processor for music output. It has small x-y touchpad MIDI controller, sampler, and built in effects processor for audio and musical instruments. Originally it was designed with DJ’s in mind, as a way of them having tactile control method of adding effects into their musical performances. 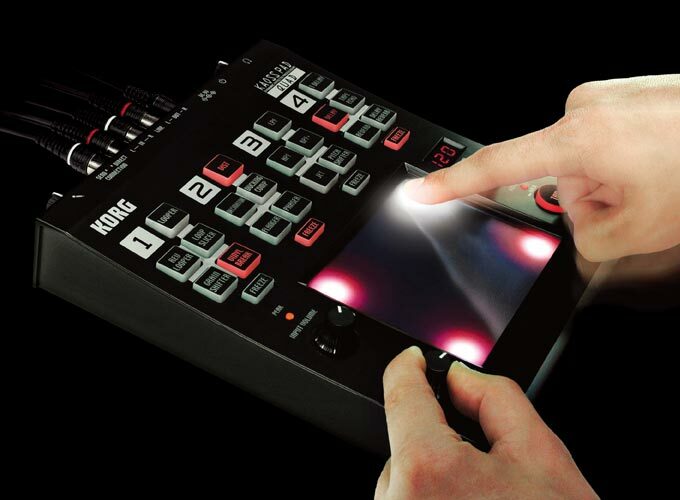 The Kaoss’s touchpad can be used to control its built in effects modules, which then can be applied to a line-in signal (sound in) or to any sampled sounds recorded from the line-in. The latest version blends up to 4 effects at once. Another large change to the touchpad is LEDs that light up in an array of colours. The illumination changes depending on the state of the effects, the BPM setting, and on your movements while performing. Famously, Matt Bellemy from the Teignmouth based rock band Muse has one built into his Manson built guitar. But influential (McNamee, D. 2017) music producers such as Brian Eno (Talking Heads, David Bowie) are also renown for exploring the Kaos’s potential to add texture and effects to their productions. The X/Y touchpad acts as a control interface that regulates the effects and filters that are programmed by the user or pre-loaded into the Kaoss. To change the parameters,live, of the effect’s blend the user moves a finger across the pad exploring the sounds required, then the user can either freeze the setting or change it to another sound setting by manipulating the pad further please. The various models of Kaoss Pad each have a subtly different purpose. Effects units for DJ’s were usually based on studio rack effects such as Echo, Delays & Compressors or DJs were forced to cobble together in line guitar effects that were design for interact with feet, switches and rocker switches (variable resistors) being manipulated via foot presses, as the guitarist hands were, by necessity to be kept close the instrument. By introducing a simple finger touch interface the musicians were given greater freedom and flexibility as to how and where to use the mechanism for adding real-time effects. Therefore for an effects processors to adopt such a radical interface was ground breaking and still has influence today. En.wikipedia.org. (2017). Korg Kaoss Pad. [online] Available at: https://en.wikipedia.org/wiki/Korg_Kaoss_Pad [Accessed 12 Oct. 2017]. En.wikipedia.org. (2017). Touchpad. [online] Available at: https://en.wikipedia.org/wiki/Touchpad [Accessed 12 Oct. 2017]. En.wikipedia.org. (2017). Effects unit. [online] Available at: https://en.wikipedia.org/wiki/Effects_unit [Accessed 12 Oct. 2017]. En.wikipedia.org. (2017). Korg. [online] Available at: https://en.wikipedia.org/wiki/Korg [Accessed 12 Oct. 2017]. Laughton, J. (2017). The Most Iconic Keyboard by Decade. [online] reverb.com. Available at: https://reverb.com/uk/news/the-most-iconic-keyboard-by-decade [Accessed 12 Oct. 2017]. KORG Global. (2017). Features | KAOSS PAD QUAD – DYNAMIC EFFECTS PROCESSOR | KORG (USA). [online] Available at: http://www.korg.com/us/products/dj/kaoss_pad_quad/page_1.php [Accessed 12 Oct. 2017]. Anon, (2017). [image] Available at: ht tp://2. bp.blogspot.com/-E4fvYhJLCnY/U6wSoWAZEVI/AAAAAAAAAKo/9Omh0OCgmiM/s1600/67.jpg [Accessed 15 Oct. 2017]. Anon, (2017). [image] Available at: https://medias.audiofanzine.com/images/normal/korg-kaoss-pad-quad-274144.jpg [Accessed 15 Oct. 2017]. This entry was posted in Inspire Tech and tagged i.